Thank you for submitting your request to the Howard County Bureau of Highways. Our staff will investigate this issue and respond. Hello, My property sits below an area that has recently been stripped of all its trees and vegetation to make room for a new housing development.Unfortunately, the developers (Harmony) didn’t see to upgrading the strom drainage around the new homes they built and my property is suffering as a result. I do know that the new houses above me are experiencing flooding as well. I had asked Ho Co to install better drainage on Forest Ave which they did, however, I don’t think the drainage system extends to cover the entirety of the new developed street. The dead end portion of Forest Ave, which is directly behind my property, is ultimately washing my property away causing basement and garage flooding. Also, part of my driveway is County land. I’d very much like to install a ‘v’ type concrete gutter alongside the driveway to direct water to the nearsest drain to help divert water. 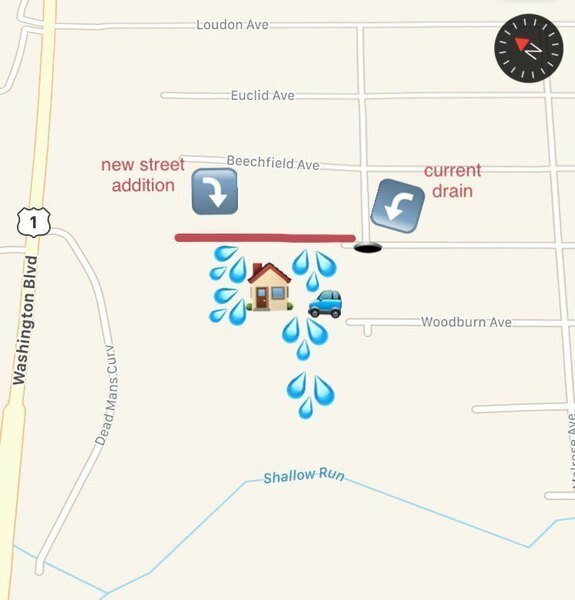 Please help alleviate the water running through these properties by installing significant drainage on Forest Ave. This is the Harwood Park section in Elkridge. Mind you, all of this run-off empties into a stream that is located below my property. Issue 4940301 has been marked as a duplicate of this issue. Stormwater runoff from Meredith Ave runs through a pipe under a short private road near the intersection of Meredith and 6th. The concrete leading to the pipe has eroded and much of the stormwater runoff now flows under the road next to rather than through the pipe, potentially undermining the road. Also, there are a lot of weeds built up by the exit side of the pipe, blocking the water, so there is constantly standing water at the entrance to the pipe. A stop sign was taken down at the corner of 6th Street and Decatur Rd during the construction of two new hones and was never put back up, even though the construction has been completed. The stop sign is still laying on the corner under a Bush. There are long potholes in the wheel tracks both north and southbound on Haviland Mill from Brighton Dam Road to the curve on the hill. Your concerns have been reported to Howard County Bureau of Highways, report #55312. An Inspector will investigate the issue and respond. Thank you for submitting your request to the Howard County Department of Public Works. Our staff will investigate this issue on August 4, 2014 and it was added to the patch list. Once added to the patch list, it takes 4-5 weeks for the patch to be completed (weather permitting). Our street was recently paved. Unfortunately on our side of Nightsong Lane the pavers filled in the gutters that run along the edge of the street, making it more likely that during a storm the water will over flow the street and onto private property, flooding the homes here. We need this fixed before flooding occurs. Please reply soonest with the steps you intend to take to resolve and specify the timeframe. Both sides of the street are affected, with the pavement filling the gutters along the street's edge and significantly reducing the capacity to carry the water to the storm drain without overflowing onto the street and potentially onto private property. 3'' DEAD MAPLE TREE WAS REMOVED ON 7/13/2018. IT WILL BE ADDED TO THE STUMP REMOVAL AND TREE REPLACEMENT LIST. REMOVE AND REPLACE ONE DEAD 10'' CRABAPPLE - WITHIN 90 DAYS. TREE WAS REMOVED ON 7/19/2018.